“There has never been a time of Greater Peril or Greater Promise”, says World Economic Forum Director, Prof Klaus Schwab who has been at the centre of global affairs for a few decades. His recent book ‘The Fourth Industrial Revolution’ acknowledges technology’s potential to connect billions more people to digital networks, dramatically improve lives and organizations and even undo damage done by previous industrial revolutions. So, as we stand at the edge of this next era of change we must ask ourselves, do we dive into the greater promise with higher consciousness? Or do we fall into the peril as a conflicted humanity? With the gurus of collective conscious – horses – leading them forward, EAHAE (International Association of Horse Assisted Education) chooses to dive into the Greater Promise. What do you choose as an individual, an organization or a business leader? In March the EAHAE International Association for Horse Assisted Education met for their 14th Annual Conference in Knüllwald, Germany. 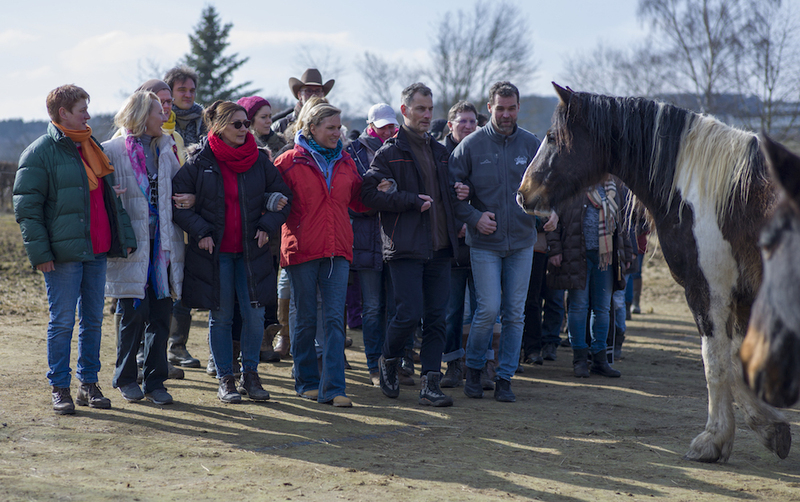 The Conference welcomed over 70 participants from 16 different countries to discuss EAHAE’s vision to see Horse Assisted Education pioneer the next phase of Leadership Development. Management experts, coaches and business consultants from the USA, Russia, Europe, Kazakhstan and the UAE came together in the presence of horses to experiment, learn how to lead and to be led, inspiring a new level of connectedness and passion within the organization. Drawing on the participants’ diverse strengths, the conference combined breakout sessions with facilitated horse assisted exercises, mirroring EAHAE client’s experiences. The 29th March 2018 collective learning was profound. Sanny Cassani and Luis Praxmarer (HorseDream Austria) led a session on the context of change happening today at an unprecedented rate. The session reinforced how effective leadership of such change has never been more necessary. The work of EAHAE and horses assisted education has never been more relevant and required. Horses have always played an important role in human development. From transport, to the military. From their role in the agricultural and industrial revolutions to sport and entertainment. It seems, as humanity develops, so does the purpose of the horse. And so today, as our world stands at the edge of the next Industrial Revolution – the Technological one – we once again look to our Equine partners to show us the way. Horses have survived 50 million years as prey animals on a predator occupied planet. The secret to their survival is their ‘herdpower’. ‘Herdpower’ refers to the collective consciousness experienced by every horse in a herd. This consciousness connects them to their purpose and shapes each horse’s choices and willingness to operate together as one unit. Horse Assisted Education taps into this collective consciousness to evoke the same experience within humans. A deep and profound experience, Horse Assisted Education offers insights into self- awareness, collaboration and leadership in a way no other learning experience can. It is EAHAE’s belief that such an approach is necessary for humanity’s next evolutionary step into a collective consciousness, for us to thrive in the ‘Greater Promise’ the next Industrial Revolution brings. Monica has been living in Dubai since 12 years and runs horse assisted leadership trainings for managers and individuals in the UAE. 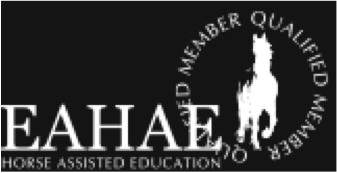 The EAHAE International Association for Horse Assisted Education is a worldwide platform for information, communication, education, certification, research and publication of every kind of Horse Assisted Education. The EAHAE has over 300 Qualified Members from more than 40 countries worldwide that work collaboratively to deliver The Art of Leadership and HorseDream training programs for individuals and corporate clients. The organization adheres to the core values of trust, collaboration and equality, particularly with regards to the horses, who are trainers, not tools. Sign up to my monthly newsletter to stay up to date with upcoming courses, new information added to the website, and more news related to horse assisted education in the UAE. I understand that you will use my information only to send me a newsletter. P.S. We need all these tick boxes to comply with the new rules of the EU, the GDPR. Sorry to make it complicated! This is only for your privacy.